SWELSIEKTE-The role of Blood Proteins. The swelling is cold, pitted, painless and variable in intensity in different parts of the body. Fluid flows freely if the skin is cut or punctured. The fluid is clear, copious and non-clotting. 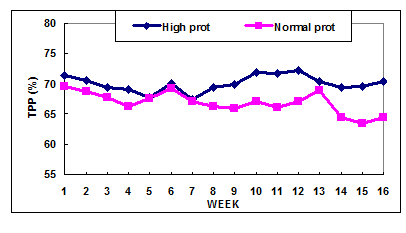 It is quite clear from a number of trials and studies that a low Total Plasma Protein (TSP) and Albumin (Alb) is the most consistent finding along with elevated Total white cell counts. 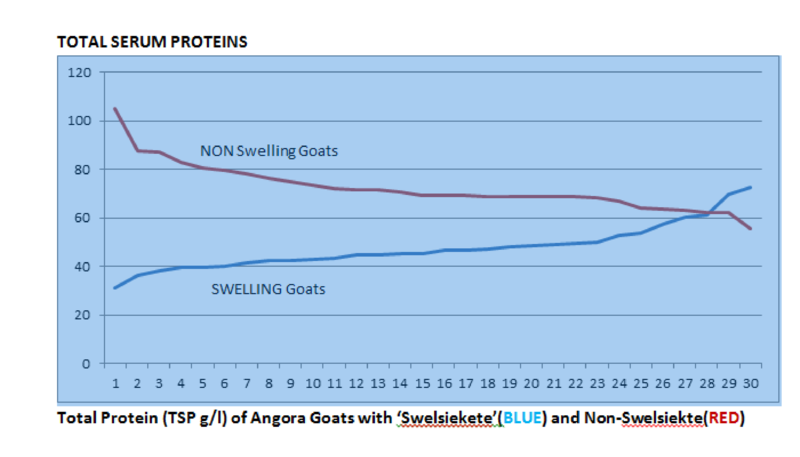 From these graphs it is clear that there if a definitive difference in the TSP and Albumin levels between goats that have ‘Swelsiekte’ and those that don’t. 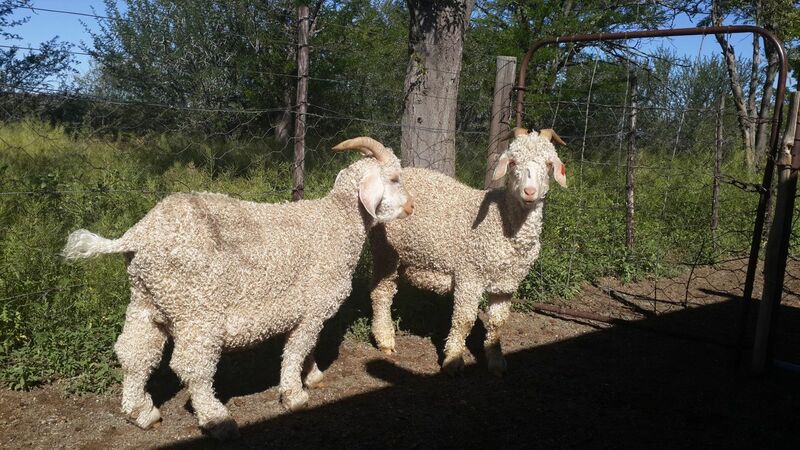 It appears that there may be a level of oncotic pressure (TSP/Alb) at which the Angora goats compensatory mechanism are no longer able to cope and at which the Swelling occurs. The plasma of oedematous goats showed a lower total protein concentration, a lower colloid osmotic pressure, lower plasma albumin levels and a lower albumin: globulin ratio than that of normal goats. Hypoprotemia as well as a higher capillary permeability. Vermeulen (1986) Experiments were conducted where Angora goats were infected with Ostertagia circumcincta (Brown stomach worm) larvae at varying doses. In all trials, all goats infected with Ostertagia circumcincta had a reduced plasma protein level. However, some stress inducing condition is necessary for the goat to develop swelling disease. The low TPP values were most noticeable just before, during and after the swelling. Goats that did develop moderate oedema had lower TPP levels throughout the experimental period. Vermeulen indicated swelling to be complex as not all cases of swelsiekte had low protein levels or a high parasiteamia. 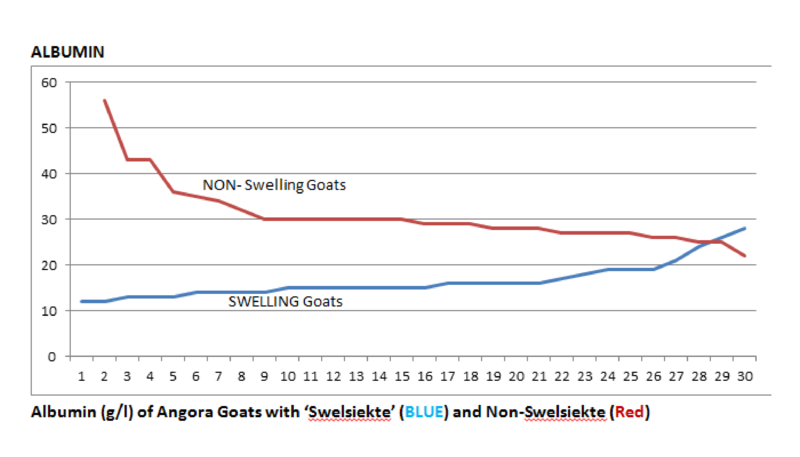 Where swelsiekte did occur it developed when the goats blood protein levels were at their lowest point. What is the cause of the low TSP/Albumins in the blood? The cause of the low oncotic pressure in Swelling disease in Angora goats is unknown and seems a number of variable causes may be involved? Research needs to be conducted as to differentiate between trans-capillary and pre-capillary membrane loss of blood proteins. What can be done while the cause is unknown? Albumin is not stored by the body and is a protein produced by the liver. Approximately 60% of it is located in the extravascular space. Albumin has a strong negative charge allowing it to be very soluble in water. In addition to maintaining colloid oncotic pressure, albumin also facilitates transportation of substances. The presence of many surface-charged groups and many specific binding sites, both ionic and hydrophobic, allow albumin to bind and transport a large number of compounds. These substances include bilirubin ( goats with swelling have been found to have raised bilirubin levels), metals, ions, enzymes, amino acids, hormones, free fatty acids, drugs, and phospholipids. Albumin functions as a free-radical scavenger. What role does stress play in Albumin levels? 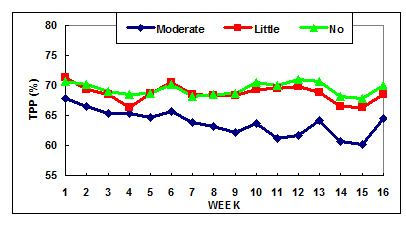 Initial decrease in albumin associated with increase in acute phase proteins. What can cause low albumin levels? Snyman and Herselman (2004) suggested that any condition / factor that contributed to a lowered blood albumin level, could be a predisposing factor for swelling disease. Loss through intestinal tract - loss of albumin does not generally cause concern unless the loss is excessive or long lasting. For the most part, the minor decreases in albumin concentration attributable to dilution alone do not seem to result in clinical consequences. The potential causes of swelling disease in Angora goats are potentially multiple and even in human medicine oedema is still not fully understood with Starling’s having now be questioned. 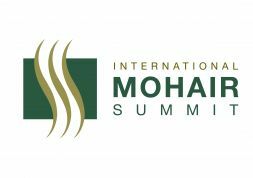 © SA Mohair Growers - 2019 | Links | SWELSIEKTE-The role of Blood Proteins.